Several options are available for pressure-sensitive label application. 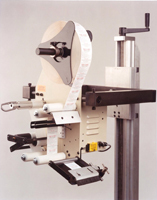 The labeling machine types shown here are relatively inexpensive, and are suitable for medium quantities(1,000 to 3,000 label orders). Larger and smaller versions of these machines are also available. If it is not possible to use a machine for your product, we can find a company to apply the labels by hand. A bottle label applicator can be used on cylindrical and tapered products. 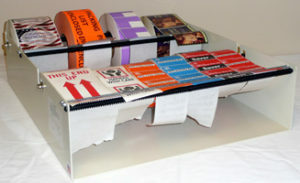 Table-top bottle labelers, like the one shown, automatically rotate the product and apply pressure to secure the adhesive bond. Larger units also come with an integrated conveyor that carries the bottles to the labeling machine one-at-a-time. 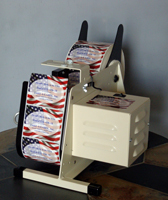 Wipe-on labelers place a label on the product and apply pressure at the same time. Labeling machine of this type are very efficient. They do not require compressed air to operate. The model shown here is designed for reliable operation and easy integration where space is at a premium. Tamp label applicators first place the label on the product, and then apply direct pressure using a pneumatic cylinder. This table-top machine is very versatile and can even be used on semi-flat surfaces such as envelopes. It also includes a convenient foot switch. Larger machines can also be integrated with a conveyor belt system. If large numbers of labels are to be applied by hand, an electric dispenser may be helpful. Each time the operator takes a label from the dispensing machine, a light sensor activates the motor and removes another one from the roll. Manual label dispensers are very inexpensive and durable. Applicator guns are also very inexpensive, and are good for situations where the label does not need to be placed very precisely.